Serial line RS-485 for connection with remote management electronic. Output contact timeable from 1-99 sec. For lock opening control. 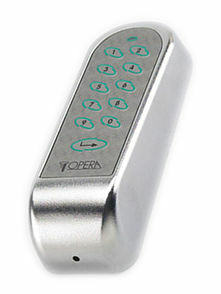 Code cancellation: single or total Keypad with 10 numerical keys plus one ENTER button. Block of keypad functions after 3 attempt of opening with wrong code. Alarm signal and timeable auto-reset.